A collection of seven original solos for developing 4-mallet marimba technique. For each solo in this collection, there is a full page of exercises meant for technical development (concentrating on the strokes being used in the piece) and piece preparation (concentrating on specific patterns found in the piece). 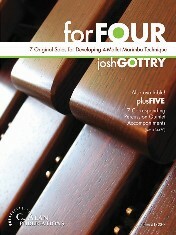 You will find that forFOUR really fills a gap within 4-mallet marimba literature.